The Factory moved in a new 6,000 m2 production hall. 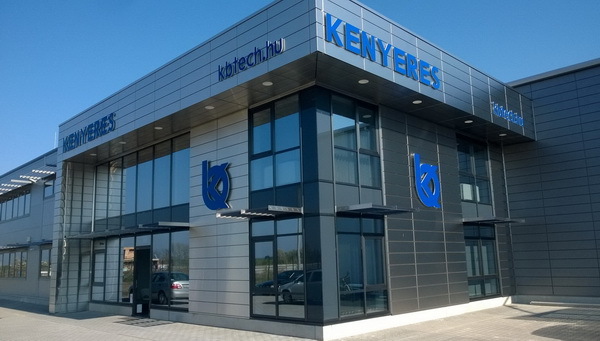 Our company, Kenyeres Biztonságtechnika was established in 1995. The company's main activity from 1995 is making different safety cabinets and vaults. The company primarily was making gun - and file cabinets, and safety wall - and furniture vaults with different safety levels mostly to the Western European market. Furthermore gun shooting gears with their accessories and electric switchboxes and thin membrane cabinets were also produced by the company. 2007/2008 was the year of produktchanges in the company's life. Major action has changed to production of accessoires made from different finesheets. Because of the way of our product sturcture we are able to process cold drawn sheets and hot drawn table sheets. During the part production we use reel drawer, sheet scissors, lasercutter and stamp appliance to dimension and finish the material. The parts receive their final shape through crushing and edgebending. The construction of the different parts happens with safetygas dwindling electode archwelding. The finished raw products' surfaces are being degreased, washed, zink phospated and painted by chemicals. In our product variety KTL painted, galvanized parts can also be found, whose production we can take on through our established delivery connections. It is important for our company that our customers are satisfied, therefore we use ISO 9001:2008 standard to make the parts on a high standard procedure, to get the highest quality products and to keep it that way.